SGU’s off-campus Safety Patrol is available for 24/7 assistance. DPSS Emergency Number 777. This number can be dialed from any SGU hard line or Grenadian cell phone. SGU’s Department of Public Safety and Security maintains communication channels on Facebook and Twitter. Follow us for campus-related general safety announcements. In order to provide a safe and secure environment, St. George’s University staffs and maintains a professional Department of Public Safety and Security (DPSS). DPSS is temporarily located on the second floor of the Westerhall building (#31) above the Simulation Center. Security officers patrol University grounds 24 hours a day, 7 days per week, and 365 days per year. They are qualified to handle any type of safety and security situation. Prior to employment, all officers are subjected to rigorous screening and background investigations. DPSS maintains a close working relationship with the Royal Grenadian Police Force. RGPF officers routinely pass through campus on patrol, and collaborate on joint drills and exercises. DPSS works closely with the Office of the Dean of Students to make certain that safety policies and procedures are uniformly executed and conveyed in a clear, consistent manner for the members of the SGU community. 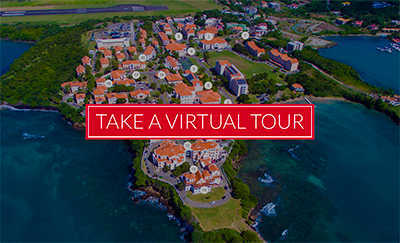 St. George’s University is located in Grenada, just north of South America and below the path most hurricanes follow. The School of Arts and Sciences and the Master of Public Health students all stayed on campus and continued their programs within a few days of the storm’s passing. However, to assist the Grenadian government in its re-building efforts, and allow them to use our safe buildings, we relocated our medical and veterinary students to US campuses. This allowed our medical and veterinary students to resume their studies within three weeks and continue their programs for the remainder of that fall term without significant interruption. The students returned to campus and the University was in full operation for all programs within five months of the storm. Over the past 13 years, we have continued to prepare our campus for weather-related events. We are confident that students will be safe on our campus and we are committed to continuous improvement of our hurricane preparedness and response capabilities, even though these events are infrequent. SGU is committed to the safety and security of our entire community. The DPSS has maintained K9 units since 2006, growing to a capacity of 10 teams to provide 24/7 patrol support to University property and the contiguous residential neighborhoods surrounding the school. Our trained teams are available to assist the RGPF if required. All teams command trained patrol dogs with the ability to track suspects, lost persons, locate evidence or other property, and search buildings, and handler protection. Selected and specially trained security officers perform the duties of Emergency Medical Service transportation drivers, manning the University ambulance when required. The primary responsibility or this group of officers is to provide security at the University Clinic. Their secondary assignment is to assist when any member of the University community experiences a medical emergency – whether on or off campus. They will support medical staff by driving the specially equipped transport vehicle; assisting medical personnel to help render capable aid at the direction of the University Health Services staff. Fire Safety Officers (FSOs) provide a focus on fire prevention, readiness exercises, and emergency response to the SGU community. The FSOs are responsible for the inspections and maintenance of the numerous pieces of safety equipment on campus – from fire extinguishers and detection systems, to first aid kits and automatic external defibrillators (AEDs). FSOs are first responders to fire alarms, but also play an instrumental role in protective actions for any kind of campus emergency. If you are unfamiliar with the operation of a fire extinguisher, please view this brief demonstration video. St. George’s University collaborates closely with the Royal Grenada Police Force and the National Disaster Management Agency to maintain a high level of natural disaster preparedness. SGU’s Department of Public Safety and Security also models best practices from the US Department of Homeland Security’s disaster preparedness resources. Island-wide preparedness activities occur throughout the year and include drills for hurricanes, earthquakes, fires, and tsunamis. In the event of a natural disaster or weather warning, the Department of Public Safety and Security will utilize a variety of methods to inform and direct our university community – including text message, email, and class announcements. Hurricanes: Grenada lies south of the typical path of Atlantic hurricanes, but hurricane conditions can occur. In the past 60 years, Grenada has only experienced one major hurricane. In 2004, a severe storm hit Grenada. However, the True Blue campus, built to withstand a Category 5 hurricane, was a safe haven for our students, staff, and faculty. Our campus safety precautions should not preempt your own preparation efforts. Learn how to prepare your own readiness plan by visiting http://www.ready.gov/hurricanes. Earthquakes: The Caribbean Plate is a mostly oceanic tectonic plate underlying Central America and the Caribbean Sea. Minor tremors are not uncommon throughout the region. Brush up on earthquake safety advice at http://www.ready.gov/earthquakes and video tutorials via USC’s ShakeOut campaign. Tsunamis: Familiarize yourself with tsunami warnings and safety advice via http://www.ready.gov/tsunamis. All students, staff, and faculty who wish to park their motor vehicle on campus must obtain a parking permit. Permits are required for automobiles and motorbikes/scooters. Click here to obtain a fillable parking permit application. Are in you in need of a temporary permit for a rented vehicle or a short-term visitor? Please complete this temporary permit application and submit it to the DPSS office in Westerhall Building, just above the Student Centre. Grenada’s electric utility, Grenlec, provides a safe and reliable supply of power to the island. Outages are rare, but in the event of power failure, St. George’s University maintains a backup generator with capacity to power the entire campus. No matter if you live on- or off-campus, brush up on power outage safety tips in the unlikely event of a prolonged outage. Please read our full SGU Dangerous Weather Emergency Plan. The PSC is found on the top floors of Campeche Hall. Comprehensive services are available to all SGU students and employees. For more information, please visit sgu.edu/psc. Call Campus Security for all emergencies (medical, criminal, safety). They can get you help right away – on campus or off campus. EMERGENCY LINE, DIAL: 777 from any SGU line or any Grenadian cell phone. Non emergencies DIAL (473) 444-3898. Family members off island, in an emergency please dial a 1 before the number and security can assist you. Call 911 to reach local police. DPSS Emergency #: 777. This number is a dedicated line that rings at the True Blue campus. It can be dialed by any SGU hard line or Grenadian cell phone. Safety Patrol can be dispatched and will respond and assist police. DPSS can coordinate transportation to the clinic or the General Hospital, and will contact the Clinic for you. Security can connect you with other support services. Counselors or administrators are on call and will step in to help local police help you.